Click here to listen to Erin’s career pathway story. Studying engineering at Deakin University while living far away from the Geelong campuses hasn’t been an obstacle for Erin Cotter, who is working as Trainee Development Engineer with Griffith City Council at the same time as being a Cloud Campus student. Erin says “My online studies with Deakin are good because I put what I learn into practice in my workplace. This helps me to retain what I learn. I have found the curriculum to be really relevant to the practical situations I encounter. My lecturers have been responsive to my individual needs”. Erin grew up in Leeton and completed her schooling at Leeton High School. She is currently studying third year of Bachelor of Civil Engineering (Honours) at Deakin University via the Cloud Cloud. Erin’s employer supports her studies, allowing her to attend residential school for one week in the middle of each semester to undertake practical classes and meet fellow students – on campus at Geelong. Erin works full time for Griffith City Council in the Engineering Design and Survey team. Griffith City Council fully subsidises her course costs. Erin has been working at Council for just over two years and has been studying part time. 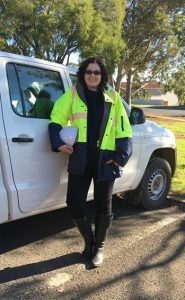 Erin is looking to stay, live and work in the Western Riverina after qualifying as a civil engineer. Deakin’s engineering and design doors are wide open to online or on-campus students, industry, research, and the community. In fact, the School of Engineering’s accredited programs in civil, mechanical, mechatronics and electrical and electronics engineering can be studied from anywhere. And the best news is that the Riverina Institute of TAFE offers articulated guaranteed pathways to do just that – studying engineering at Deakin through the Cloud Campus or on campus in Geelong. The School of Engineering is synonymous with one of the most advanced future-focused engineering facilities in Australia, the Centre for Advanced Design in Engineering Training (CADET). This cutting-edge, $55m facility is equipped with high-end equipment, laboratories and studios, as well as exceptional expertise to drive digital manufacturing, rapid prototyping, 3D modelling, virtual reality, high voltage, sustainable infrastructure, water solutions, infrastructure, renewable energy, chemical and corrosive engineering, robotics and design. CADET was purposely built to enable a student-centred learning model through a Project Oriented Design Based Learning Programme (PODBL), as well as industry engagement. The unique teaching model is based on extensive research into successful, innovative teaching approaches in Europe and the US. The model prepares graduates to drive the entrepreneurial solutions for rural and regional engineering businesses of tomorrow. Deakin’s School of Engineering welcomes collaboration with industry and research engagement. Together it is possible to drive and shape the engineering and design industry, facilitating the Australia of tomorrow.